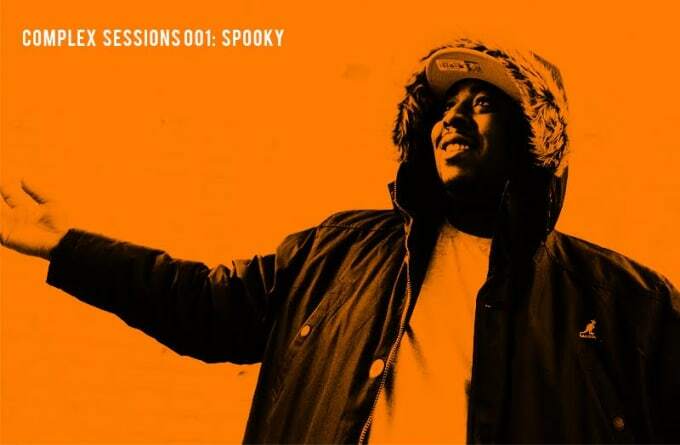 Kicking off a mix series has to be done right—​you can&apos;t do these things in half measures—​so who better to kick off our Complex Sessions series than the Spartan man himself, Spooky. After cutting his teeth on Mystic FM and Heat FM in 2002, Spooky soon joined Slew Dem in 2004 alongside legendary grime figures such as Tempa T, Chronik and Esco (R.I.P). Since then, he&apos;s been diligently honing his craft. The first time we heard his own sonic creation committed to vinyl was the infamous "Joyride" in 2005, a dancehall classic flipped into a grime banger for the ages, and though his sound may be sleeker than it was back then, he&apos;s lost none of that raw power. Recently, Spooky has lent his production skills to a staggering number of grime projects, including—but not limited to—​Capo Lee&apos;s Why Not? mixtape, President T&apos;s Greatest To Ever Touch Down LP, as well as releasing his own productions and making an absolute tonne of radio appearances. We managed to talk the grime historian and dancefloor rattler into putting together the first of many Complex UK mixes. As we all know, Spooky goes all out, and at 85 tracks he&apos;s set the bar unreasonably high. It&apos;s basically a whole heap of warped creations I&apos;ve been knocking out since 2005. Some of these have even seen a revival recently, which I&apos;ve been loving. I left so much out, though, so maybe a Part 2 might have to be on the cards. It&apos;s that deep! "Spartan", for sure. But I&apos;ve got around four of my own different versions so you&apos;ve just gotta slap those headphones on, crank the volume up, press play, zone out, and find out which ones I slapped in there. Too many to mention! Seriously. I left out quite a good batch of vocals, collabs, remixes, and bootlegs. But it&apos;s still 80-plus tracks long [laughs]. I was legit still in primary school. I remember picking up a Pinky & Perky 7" vinyl and UB40&apos;s "Cant Help Falling In Love" on 7" vinyl from Woolworths. The good ol&apos; days! I&apos;ve just had the Ramsey + Fen & MJ Cole remix of Kym Mazelle&apos;s "Quality" drop through my door today. I&apos;ve been after that for a while. What do you want to see happen, musically, over the next 12 months? Musically, I wanna see more new instrumentals get more love this year. It&apos;s been quite vocal-based, which I&apos;m obviously a big supporter of, but I&apos;m a producer myself, so, you know. Ankle swingers with the socks exposed, and the dead-out shoes to match. Allow it, man!